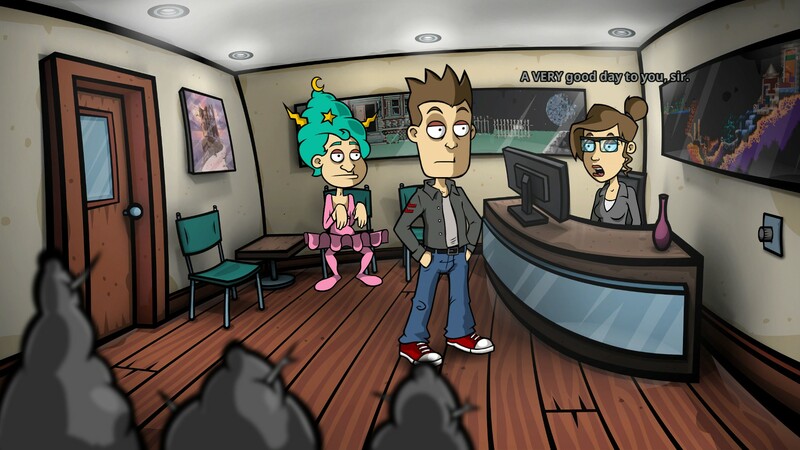 After our preview of Randal’s Monday, I was interested to see what changes would come along in the final version of what prides itself as a traditional, old school point and click adventure game. Though it wasn’t without its shortcomings, the preview had real potential, so I had high hopes for the finished product. A far amount of my opinions from the original article still stand, so you may want to peek at it before reading on, because I will refer back to it frequently. Man… This guy’s got some good stuff. As I said in my prior review, the visuals are well above average for games of this type. Quite often when “old-school” is invoked, retro visuals are called for. Now as much as I like to see decent pixel art and 8 or 16-bit graphics, when you’ve seen a dozen games like that, you long for something different. 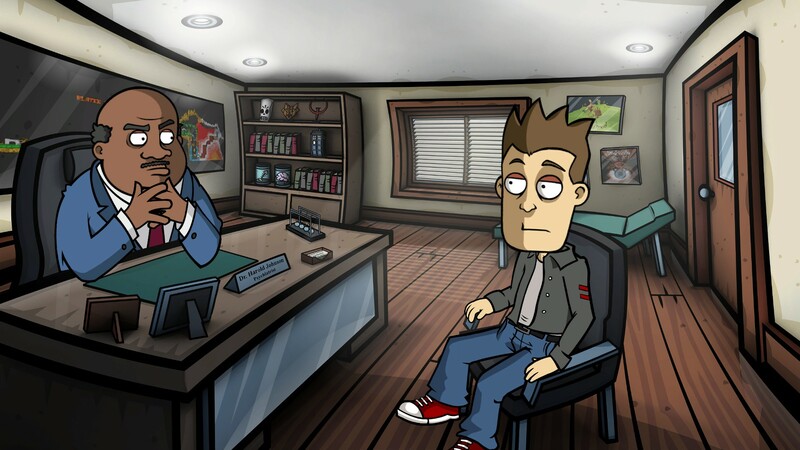 Randal’s Monday delivers that in the form of cel-style animation. The characters all have a consistent design to them, a style that is a bit reminiscent of a Seth MacFarlane animated series. There is a wide range of animations, rather than a small palette of stock motions recycled for any number of actions. Heck, there was a “removing the extendable duck and checking if it is long enough” motion. Most impressively, though, about three quarters of the way through the game the entire cast changes costumes, meaning that Randal gets a whole fresh set of animation, and many ancillary characters do as well. That’s the other thing you need to appreciate about Randal’s Monday. There are a LOT of characters. Aside from the key characters of Matt and Randal, there are extended interactions with everyone from several members of the local police department to an oracular bum. Some characters even shift through several different iterations, each one subtly to drastically different from its prior appearance. It’s quite a cast. 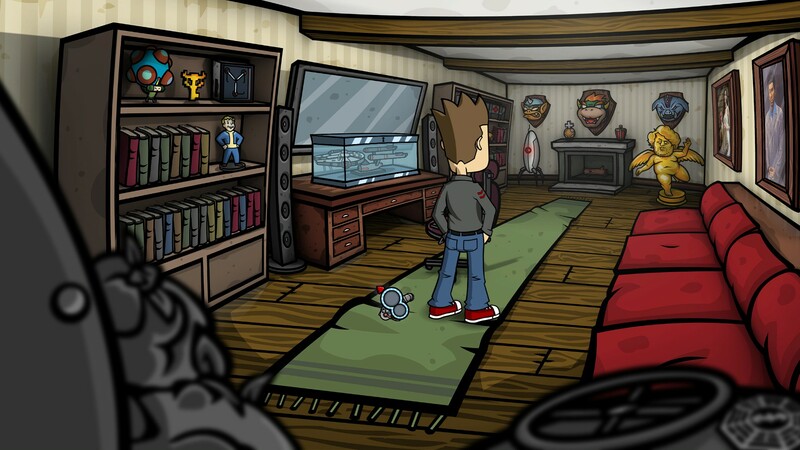 A final thing worthy of mention regarding the visuals is the sheer density of pop culture references. They can be subtle, like a pair of suspiciously Sonic the Hedgehog-like sneakers hanging in the foreground to the blatant, like the presence of unaltered film posters hanging on the walls or a subway map almost entirely populated by adventure game references. The pop culture density of the visuals is incredibly high, though I never found myself particularly irritated by it. No… NO. I WON’T DO START OVER AGAIN! The gameplay is where this game will be made or broken for most people. Old-school is the term they love to use, but let us take a moment to think about the old-school games. They were difficult. Often outlandishly so. This can largely be said of Randal’s Monday as well. There are plenty of puzzles that flow logically from point to point, but for each one of those it seemed like there was also a puzzle that forced me to resort to the tried and true “use everything in your inventory on everything else in your inventory. The game didn’t go so old-school that it would put you into an unwinnable situation if you forgot to “take the Rubik’s cube from the locker in the first scene”, so you can rest assured that you will always be able to win even if you get stuck, but some puzzles managed to single-handedly knock whole points off the final score, most of the time when they prevented me from accessing the UI to save and take a break. I’m looking at you, Inkblot Test. For the most part, every answer is at least hinted at, but sometimes VERY subtly. I missed more than a few. But let’s step away from the content of the gameplay and look at its function. Your interactions in the game are boiled down to “interact with” and “look at.” That’s it. And really, that’s all you need. Interacting with an object you can take, takes it. Interacting with a door opens it. These are even mapped to the right and left mouse buttons, so the game can be played exclusively with the mouse. A now mandatory addition to the adventure game toolkit is present in the form of the “hotspot button” which reveals to you which things in the scene can be interacted with, rather than forcing you to click on every pixel. Sure the hair is nice, but were are the meat balls? Another almost mandatory mechanism present in this game is a hint system, though the game tries desperately to prevent you from using it. Because of the difficulty of some of the puzzles and my atrophied sense of adventure game logic, I ended up killing a lot of kitties (you’ll get it if you have to do it). It isn’t so much a “hint” system as a “walkthrough that is inside the game,” breaking down each chapter into a series of tasks which then need to be completed. This is good in that I’ve more than once been given “hints” in other games that didn’t help me one bit. But it’s bad in that if you need help with just one tiny part of the end of a section, you need to work your way through the hints for the entire section to get that help. There are some other interesting gameplay mechanics playing upon the premise, but we’ll go into those in the story section. I was impressed with the voice work in the game. Randal is voiced by Jeff Anderson. In other words, Randal is voiced by Randal. (The character’s name is Randal Hicks. Clever.) There’s what at first seemed like a shoehorned in cameo by Jason Mewes reprising his View Askew character, but later he ends up actually having a role in a puzzle. The rest of the cast, though, does a pretty good job too. There isn’t exactly room for a lot of dramatic interpretation, but there was plenty of room for character, and the lines were delivered quite well. Don’t I know you guys? The music didn’t make much of an impact, but it set the tone properly. I’ve got an ambivalent relationship with the story for Randal’s Monday. At its core, the game is like if Lord of the Rings and Groundhog’s Day had a baby. 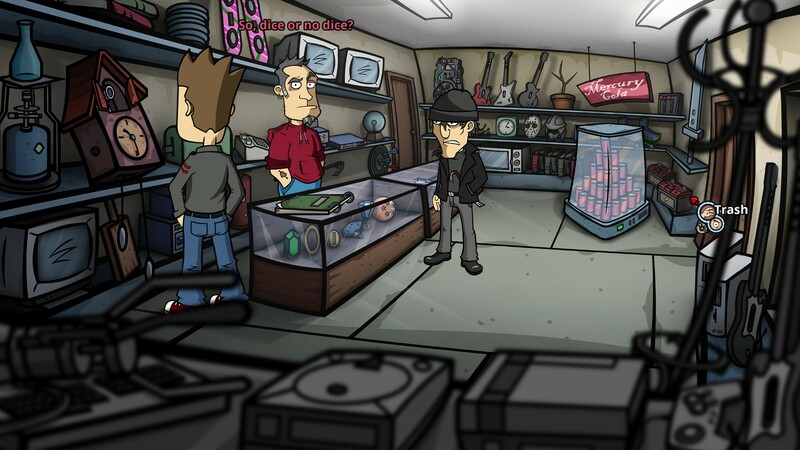 Randal is a frankly despicable protagonist who is, among a long list of flaws, a kleptomaniac. When he steals his friend’s engagement ring, it turns out to be a supernaturally powerful artifact that, among other things, curses him to repeat the same day over and over. There are a few key things about this process, though. Anything he changes stays changed in the next iteration, and his inventory is consistent day in and day out. This produces some fairly interesting sci-fi concepts. Essentially, you are going to sleep each night and waking up on the same day, but in a parallel universe where all of the things you did during the last iteration had already happened. This means that there are other subtle or absurd changes native to that universe. Here and there you’ll meet characters, usually associated with the ring, who are immune to the reset. The fact that your inventory is constant adds some problem solving possibilities to exploit (like performing an action which has a once a day pay off, but doing it THOUSANDS of times to accumulate a necessary quantity, or letting an item age in your inventory such that it looks like it was sold expired). This produces dramatic pressure as well. For much of the early game you start each day paying three months of back rent, which means that you burn through money quickly and might soon not be able to leave your apartment. All of this is driven by the plot, though, and there is no “go to sleep” button, so it is more for the writers to play with than you. I can’t seem to make up my mind about the depth of the plot. Setting aside the really cool premise and the neat stuff they do with it, it seems at time like they are trying to reveal to Randal through the consequences of his actions that he needs to change his ways, and to illustrate to him the awful effects he’s been a having on the lives of his friends. Other times you are forced to do infinitely worse things to your friends than you’ve ever done before just to proceed. Tim Shafer, ladies and gentleman. The dialogue can be witty at times, but the pop culture density here reaches super-critical levels. There are whole conversations which you MUST sit through that are just long strings of pop culture banter. Sometimes whole speeches are lifted from famous films and you are required to endure them LONG after the joke has run its course. The amount of pop culture in the dialogue is so heavily forced, and there is SO MUCH DIALOGUE, that the signal to noise ratio for useful info can drop very low and you may find yourself skipping important stuff just because you don’t want to have to cope with another five lines from Pulp Fiction or Shawshank Redemption. 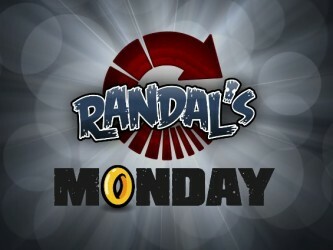 The production value is off the charts for Randal’s Monday. Every line is voiced, the art and animation is detailed and high quality, and the writing is typically very good. If you can tolerate some completely off the wall puzzles (which one would hope you’d be expecting if you’re playing an old-school adventure game), and you don’t mind an 80/20 split between references and original content sometimes, then I can thoroughly recommend the game. 7.9 / 10: A proper and extremely well made old-school adventure game, with some maddening puzzles and a near overdose of pop culture.